Looking for the best ever homemade play dough recipe? This is it! 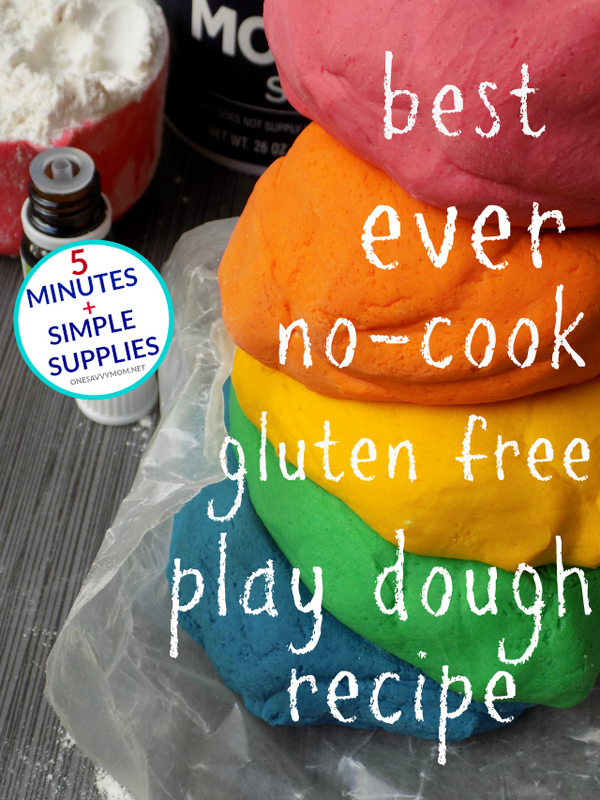 This homemade play dough is no-cook, all natural and gluten-free (for kiddo's that have gluten allergies and may still be prone to taste-test everything). If you don't want to make it gluten-free, you can easily swap out the gluten-free flour in my recipe with regular all-purpose flour. This play dough recipe only requires a very simple list of supplies, and it only takes about five minutes to whip up a big batch. We made all five colors pictured, with one batch. If your child is past the taste-testing phase, you can also add a drop or two of your favorite kid-safe essential oils to your homemade play dough. I added a different kid-safe essential oil to each of the different colors, and my toddler loves it! It's a super fun and creative sensory experience, with the added benefits of aroma therapy. This play dough keeps for months, when stored in air tight plastic containers. 4 cups gluten-free flour (we use Cup4Cup brand - you can find it at Target and online) - you can also easily substitute the gluten-free flour with all-purpose flour. We have allergies in our house so we opt for gluten-free. Slowly add bowling water to mixing bowl. Stir/fold ingredients and water until it becomes a slightly sticky combined dough. Form ingredients into a ball and remove from bowl. Knead dough to remove any lumps. Next, separate dough into five equally sized balls. 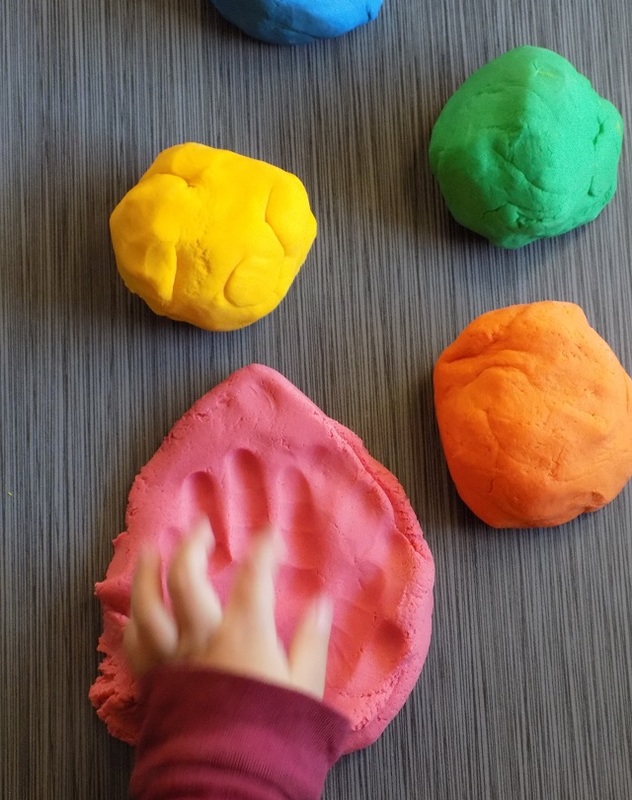 Add 4-5 drops of the desired color of natural gel food coloring to your play dough (1 ball of dough/color at a time). 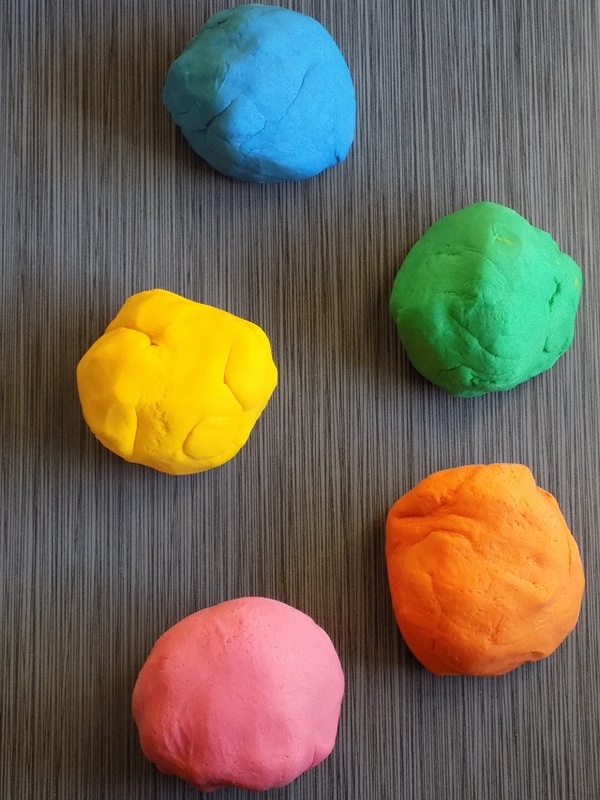 Knead/fold dough until coloring has evenly dyed the play dough. Add a few more drops of natural gel food coloring to create brighter colors. Store in air-tight plastic containers in a cool dry place. When stored properly, this homemade play dough lasts for 5-6 months. If dough starts to dry out a bit, simply add a drop or two of oil + a drop or two of water and knead it into the play dough to refresh the consistency. Play, create, and have FUN!